How is testosterone to estradiol ratio calculated? What unit is testosterone measured in? What is testosterone to estradiol ratio? The calculation of testosterone to estradiol ratio, also known as T/E2, is a parameter linked to a whole spectrum of male health aspects, primarily associated with sexual functions. 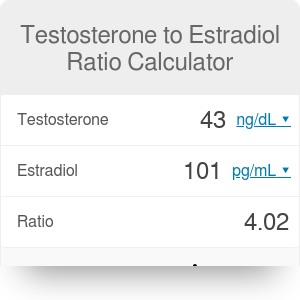 The values needed for the estimation are free testosterone (T) and estradiol (E2) concentrations. The calculator can also be used for converting estradiol and testosterone units of measurement. The tricky part is that before the calculation of testosterone to estradiol ratio, both hormone concentrations need to be expressed in the same units, and they're generally presented in different ways: testosterone in ng/dL, and estradiol in pg/mL. There's no fixed range for the ratio value. It's important that testosterone (10-35 nmol/L or 300-1000 ng/dL) and estradiol levels (50-200 pmol/L or 14-55 pg/mL) are within normal ranges. There is a very interesting article by drs. Moskowic, Eisenberg, and Lipschultz on the topic of T/E2 ratio fluctuations. Check out our other calculators to see how progesterone, cholesterol, and glucose units are converted. Imbalance of testosterone/estradiol promotes male CHD development. Check out other ratio calculators, such as cholesterol ratio calculator. Testosterone to Estradiol Ratio Calculator can be embedded on your website to enrich the content you wrote and make it easier for your visitors to understand your message.